This special limited time offer is subject to expire without notice. The Wedding Planner Certification Program administered by The International Institute of Weddings in association with The SuperWeddings Certification Program accepts students from all around the world. The International Institute of Weddings and SuperWeddings are dedicated to the provision of the highest quality of training, support, and professional development for wedding planners on an international basis. We currently have students in many countries around the world, including New Zealand, Ireland, Australia, South Africa, Dubai, England, Zambia, New Zealand, Ireland, Belgium, Germany, Spain, Costa Rica, Puerto Rico, Trinidad, Nigeria, China, The Philippines, Romania, Turkey, Luxembourg, France, Jordan, Barbados, Cayman Islands, Egypt, Israel, Brazil, Japan, as well as countless others. All training is done very successfully via distance learning and all students receive the same level of personalized instruction with a tutor who is assigned to work with them via email. All assignments can be submitted to your instructor via email. You will also be able to communicate with your instructor (ask questions, etc) via email anytime you require additional assistance. Email correspondence to instructors is answered promptly, generally within 24 hours at the maximum (except on weekends and holidays). This is the best decision I have ever made. To be quite honest I was very sceptical about reading all the coursework by on my own without attending any lectures or seminars. But to my greatest surprise this Textbook is laid out so clear that I found it so motivating and I just could not stop reading it. I feel very confident about starting my business now. I would definitely recommend this course to anyone who wants to become a professional wedding planner. There was nothing the course didn't cover. I did not know anything about wedding consulting and planning when I started this course, but I feel that it covered everything I needed to learn. It is a necessary course for anyone who wants to be in the wedding industry. I like the fact that you get to do the reading in your own pace. I am really glad I did it. You are welcome to use my feedback as a testimonial . This program is based in North America, but because it is an internationally recognized certification program, we receive a lot of questions from people all around the world who are interested in obtaining wedding planner certification through our organization. As such, we've assembled the following information specifically for international students (outside of the US or Canada). If you are located within the US or Canada, please head over to our main page for the wedding planner course. "After completing the SuperWeddings Certification course I have gained all the needed knowledge to not only start a wedding consulting business, but to make it a huge success. I liked the fact that everything I need to know about being a wedding planner was fully covered in this course from start to finish. Examples that were given in the training manual and lessons really helped me get a clear picture of what scenarios I could expect. A job well done in compiling a program that I'm sure all students will understand and also enjoy. Knowing that I could always contact my instructor if I need to, gave me ease of mind that I don't have to worry if I didn't understand anything. I definitely recommend this course. It's easy to follow and you learn a lot. There was not a thing that was not covered in this course. And I like that there is the option to further your studies if you want to through more advanced and specialised courses from SuperWeddings as your career and business develops. Thank you for proving me with all the knowledge I need, and for making studying fun. I would gladly provide you with a letter of reference for this course if requested. Once you enroll for the course, you will be contacted by the instructor assigned to you. At that time, please just drop her a note to let her know that you won't be starting your studies immediately if that should be the case, and there will be no problem. All assignments are be submitted to your instructor via email. You will not be required to send in anything by mail or courier, so there are no unnecessary delays and no additional expenses associated with mailing in your work. Thanks to the age of technology, it's all done with the click of your computer mouse. You will also be able to communicate with your instructor (ask questions, etc) via email in order to enjoy the most cost effective and time efficient means of communicating. I have enjoyed the personal feedback received from my assignments. The style of these assignments was a very influential part in my decision when choosing this course. Most vocational courses are accompanied with a simple tick answer sheet - that may be fine for a "fluff" course, but it has no value if you legitimately want to learn anything. I wanted to gain a deeper understanding of the wedding industry and I feel that I have accomplished this, through the course, the assignments, and the valuable feedback provided by the course developer, Linda Kevich. I feel tremendously fortunate to have had this opportunity to learn directly from such a well recognized and highly respected expert in the wedding industry. I am wondering about the difference in some areas between countries - will this material be applicable since I am not in the US or Canada? Absolutely. Again, the course was developed for use in training wedding planners on an international basis. It is an internationally recognized wedding planner certification program and has been used by students literally throughout the world. You will find the material highly relevant, just as our students in France, Germany, West Indies, Japan, Egypt, Israel, United Kingdom, Philippines, and many others countries have. Our focus in developing this course was to ensure that it would be of benefit to students internationally - not just in the US or Canada. We offer ongoing support to all of our students, regardless of their location. We are very interested in developing long term professional relationships with our wedding planners, and we encourage students of our certification program to remain in touch with us after completing the program so that we can continue to provide them with assistance and opportunities for exposure and further professional development. Keep in mind that the SuperWeddings site also has a large international audience - it is by no means limited to US or Canadian visitors. Each day the site is visited by thousands of brides in an average of 84 different countries! I totally recommend this course to any person interested in being a Certified Wedding Planner. I have searched for so many months to find a course in Australia but only to find Event Management courses and it required 2-3 years to complete. As a mother of a 9 month old, I was so ecstatic when I found the Wedding Planner Certification course through SuperWeddings / International Institute of Weddings. It is extremely in-depth and extremely affordable. I could study at my own pace without leaving my home. Our instructor, as well as the course developer herself, Linda Kevich, is on hand to help out where need be and her feedback from the assignments is really encouraging. I'm now looking forward to my new career for myself and my family. - I have enjoyed the personal feedback received from my assignments. The style of these assignments was a very influential part in my decision when choosing this course. Most vocational courses are accompanied with a simple tick answer sheet - that may be fine for a "fluff" course, but it has no value if you legitimately want to learn anything. I wanted to gain a deeper understanding of the wedding industry and I feel that I have accomplished this, through the course, the assignments, and the valuable feedback provided by the course developer, Linda Kevich. I feel tremendously fortunate to have had this opportunity to learn directly from such a well recognized and highly respected expert in the wedding industry. - I finally finished the assignment for session II. I must say I really enjoyed doing it and did not find it difficult at all. I wanted to thank you very much for all your help with all the questions I had and for always having time to answer them even though I know you are extremely busy! I really enjoyed working with you, and really hope to meet you in person one day!!! Once again, thank you so much for everything, and I hope to receive my certification. I (think) and hope I did well. I will be waiting for the evaluation. Feel free to use my feedback for your website. My best regards to you and hope to hear from you soon!! - Linda, I'm so thrilled to see my results. Thank you so much for the assistance extended to me. I was able to grasp lots of things which I was not aware of about the wedding industry through the program. I will keep in touch with you regarding my career as I would be very happy to obtain your guidance throughout. Once again thank you so much for the great support you have extended to me and I wish you all the very best! I was very pleased with the information and found it informative and useful. It was well presented and informative, even for me who is already in the wedding business . I have learned a lot from the course and felt it was extremely relevant. It was simple to understand, yet dealt with all aspects of setting up a wedding consultancy business. Any questions not answered by the course could be addressed to my tutor who was very helpful and informative. I feel it has put me in good stead to start up my own business and has given me a head start above others who might not have done the course. I found the course very helpful and it gave me an idea of where and how to start in what, potentially, is a maze of questions. I would recommend it without a doubt. I felt everything I needed to know was covered . Very satisfied. I enjoyed reading the literature and completing the assignments. I would most definitely recommend the course, in fact I have already recommended it to my sister. All topics have been covered. I think the course is very good, especially as it has been a long distance learning course, I think it really has worked well. I have been impressed with the lengthy feedback that you gave back to me regarding my assignments . I'm not even half way through the course and already I had a couple of meetings with potential clients and I'm about to sign a contract for a big wedding in Antalya! On Thursday there's another serious meeting for a wedding with 250-300 guests expected :)) Have a great week Linda and thanks a lot! I already had a wedding business before I took the course, and was hoping this course would help increase and improve my business. The course has been VERY informative and the information - which I have already started to put in to practice - is greatly appreciated. With this new found information I know that, once used properly, will increase my clientele. I am 23 years old, born in Israel but living in Spain since many years ago. I have received the course material beginning of this week and I must say I have started reading it immediately and just couldn't stop! :-) So far it is exactly how I wanted it to be and I am sure I will be satisfied until the end. Thank you for this opportunity and for wanting to assist me with any question I might have. I obtained a lot of knowledge from this course and am so grateful that Linda had all my questions answered every time I needed advice or assistance. I am now done with my second assignment and hope to receive my diploma so that I can say that I am a professional wedding consultant who is certified by the International Institute of Weddings!! I definitely recommend this assignment to anyone who dreams of becoming a professional wedding consultant. There was nothing left out, it covered absolutely everything and even much more than I expected!!! I enjoyed everything about the course. It covered everything in detail and really helped me understand how to start my own business as a wedding consultant. I loved the fact that I could study on my own pace and that I had all the help I needed from Linda whenever I had questions concerning the course. The course was easy to read, and most important - interesting and fun! Once I started reading it I just couldn't stop. It covered absolutely everything and I am so glad I made the choice of taking this course and become a professional wedding consultant like I always dreamed! I did compare this course to others, but chose this one definitely because of the depth of info covered. I strictly look for the best, because I want to achieve the best, and I have found it in this course. Thanks for all your time and effort!" One of the reasons I decided to go with this training program was because I observed that you had students from Barbados who seemed to be very satisfied, as well as from Australia and the UK. I needed something that was universal in nature. The material seems to be applicable anywhere in the world. I also like the idea of an instructor so that if I have problems I can get some feedback". I have completed my second reading of Section 1 of the Wedding Planner Certification Course and taken many notes. I congratulate you on a very comprehensive guide to this very exciting industry. I feel with this as my "bible" I will be ready to face the challenge of not only becoming a wedding consultant/coordinator, but of setting up a home-based small business. I feel confident that with the knowledge you have given me I will be a success. A degree of that will depend on me, but I am highly motivated. So I now feel ready to start on my first assignment. I will be eagerly awaiting its arrival! Thank you." The Superweddings certification course also contains unique ideas on marketing and wedding planning assistance to brides in my area. These are the key factors, which will allow me to excel in this industry as an independent wedding consultant. Most other wedding certification courses do not offer the ongoing guidance and support that Superweddings offers - it is quite a unique program that allows you to get started in this industry with a full network of resources! You treated me with really great customer service and you always returned all my e-mails;. Above all you had my complete confidence throughout the course knowing that you were only an email away should I need your assistance. I have to say a big THANK YOU for helping me through this course and guiding me to becoming what I believe will be a great wedding consultant. 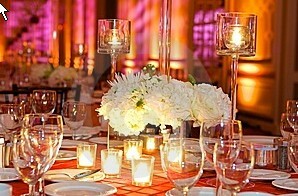 I know that Superweddings.com have other courses available which I would love to look into in the near future. I would be more than happy for you to include my feedback in the form of a testimonial. Hi Ms. Kevich, First let me tell you thanks for the advice. Especially the thought about [edited: order the course and receive this level of tailored advice!]. That's great! I'll be grateful if you used some of my pictures on SuperWeddings.com. After all, free press is great. The bridal show went quite well and I've attached a picture from it for you to see. I actually went with the colours fuchsia and orange to stand out and it really worked. I've also attached a picture of a wedding I did two weeks ago. I look forward to receiving my certificate. Please let me know when you're doing classes on theme weddings! © 2013 SuperWeddings.com. All Rights Reserved.